This is Lily the first day in the hospital. They had already put in her IV (that's why her hand is wrapped) and had given her some pain medicine. I think by this point we knew she had swallowed a pin, but I thought it was a bobby pin. 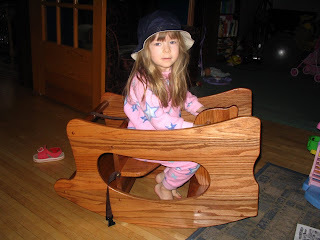 Lily loved playing in the "Toy Room." It was just across the hall from us and much brighter and more cheerful than our room. The highlight was this little wooden fort. 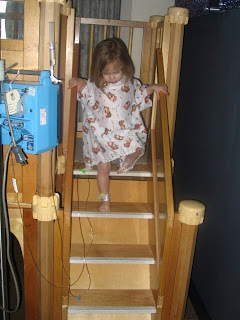 Lily loved just climbing up and down the stairs. We ate several meals (or tried to entice Lily to eat several meals) here because it was more fun than our room. This is after her appendectomy - her IV was put into her foot since she had pulled it out of her hand the night before. Our favorite LPN Sue was taking Lily's vitals. We really liked Sue, she was with us for several days and one night. 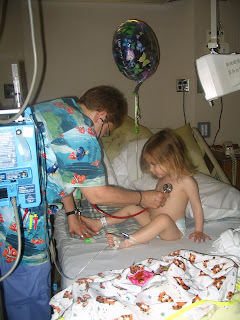 The peds floor did everything they could to keep our nurses the same from day to day. This really helped Lily feel at home. We're home! The bright spot of the hospital stay was all the balloons people sent Lily. At one point, holding a balloon was the only way Lily smiled. She even napped while holding her balloon on Friday. The poor kid walked the halls visiting the nurses and showing off her balloons. 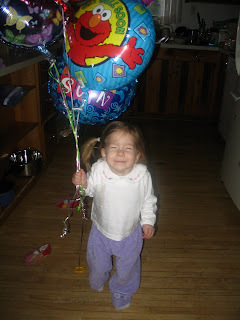 The balloons were better medicine for her than anything else! Thanks to everyone who visited us and sent us messages! So... I promised more explanation about Lily. Since we woke up ungodly early this morning and are currently sitting in the family room of the hospital (Lily doesn't want to watch cartoons in our room) I'll 'splain. 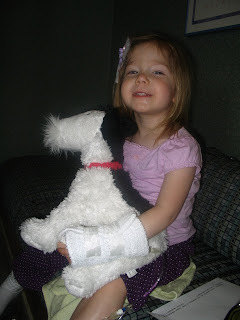 Last Tuesday afternoon Lily started saying that her "Tummy owie." I watched her but didn't think much of it. By Wednesday, Lily didn't want to walk on her own or do anything but whimper and be held. I took her into the office for a few hours with me while I tried to get an appointment with our pediatrician. Lily sat on my lap, not saying anything the whole time we were at my office. Our dr. got us in during her lunch break (go Dr. Shar!) Dr. Shar immediately thought we should be admitted to the hospital. Now this is normally a laid back, let's wait and see sort of doctor, so when she says, "Let's admit Lily," it scares the heck out of me. I thought we were just going to get an antibiotic and go home. Once in the hospital, the doctor and resident started the poking and prodding. They decided that this was much more serious (possible appendicitis or kidney infection) and scheduled a round of tests. We rode down to the radiology in a wheelchair, which was a huge deal for Lily. :) The ultrasound tech started saying things like, "what kind of medical device does she have in her tummy?" We discovered that she had a pin of some sort in her intestine. An X-ray confirmed it and determined it's exact location. 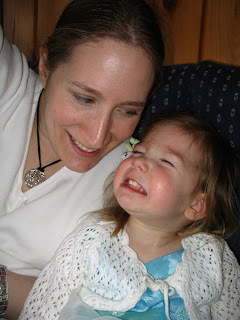 The doctors felt that she would pass it on her own and wanted to take a wait and see approach. So... we started laxatives and an IV (she wasn't eating or drinking at all). Thursday, another x-ray. Pin in same spot. More laxatives. Friday, pin in the same spot. The docs decided that maybe solid food was in order (she had been on a very unappetising liquid diet). Maybe we would be able to continue the wait and see at home. Unfortunately, after a short nap, Lily threw up her breakfast and was running a fever. The nurses called in our surgeon and he had us get another x-ray. The surgeon came in and asked a lot of questions about Lily's vomit and her pain. Most of the same questions he had been asking all along. Lily answered everything exactly the same way she had every day. When you ask her how she's doing, she says, "Pretty owie." The surgeon scheduled surgery immediately, thinking that the pin had perferated her bowel. Taking her into surgery was one of the hardest things I've ever done. It was horrible and I almost cry just thinking about it. However, after about an hour, the OR called us in the waiting room and told us that the doc had removed the pin and things were looking good. After another hour, the doc came to see us. He drew a picture something like this. The surgeon explained that the pin travelled through her stomach, into her small intestine, through the entire small intestine (we think without perforating anything!! ), and through the valve into the large intestine. For some reason, instead of following the path of least resistance (and all common sense) the pin did not get passed through the comparatively large intestine. Instead it went through the tiniest possible opening into the appendix. The surgeon found the pin poking through the appendix. This kid is truely a miracle. Instead of having to cut into the intestine and possibly having to do a bowel resection or something equally scary, the surgeon removed what's possibly the most useless organ in the body. You don't need your appendix and Lily will never miss hers! Lily had her appendix out last night. It's a very long saga (starting Tuesday night/Wednesday morning), but the short story is that she swollowed a pin and it went into her appendix. She is doing well this morning but is in a lot of pain. I'll post more including cute hospital pictures when we are home. This morning Addie had her red haired fairy out. For some reason, she never remembers this fairy's name, only that she's a friend of Tinkerbell. Addie walked up to Adam and Ray and asked, "Daddy, what this fairy's name?" Adam looked at it and said, "I don't know." Addie: "No Daddy, what her name?" Without skipping a beat, Addie turned to me, "Momma, what this fairy's name?" Addie: "Daddy, her name is Prilla." Just so we're all clear on that. 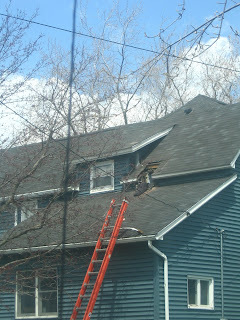 See that hole in the roof? It's directly above the ladder. 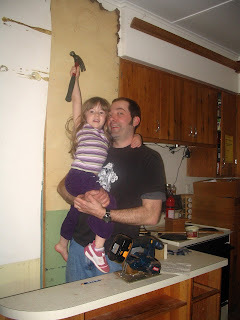 It's a huge gaping hole that leads right into Addie's bedroom. From Addie's bedroom there is a hole in the floor that goes right into the kitchen and probably by the time I get home it will go all the way into the basement. It's a big hole. A really big hole the size of a small closet. 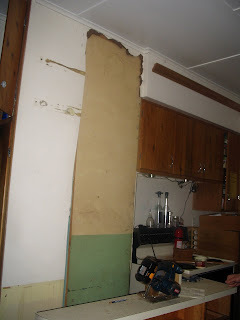 What scares me is that the guys who are doing it (very competent people I am sure) say they may accidentally take out part of the living room wall when they are taking the chimney out of the kitchen. That's a lot of repair work that has to be done. Please please cross your fingers that it doesn't rain before the roof gets patched today. Please pray that one of my children doesn't decide to "slide" down the hole. 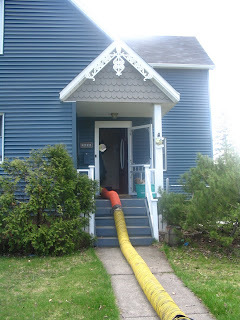 Here's the vacuum hose that is sucking up all the dust and small debris. 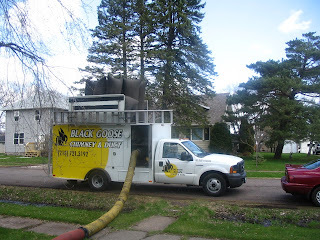 And the vacuum truck. See those big vacuum bags on top? Pretty cool. Those bags are huge! This is all very stressful. Not to mention the lack of water at my house. That may have to be explained another day. 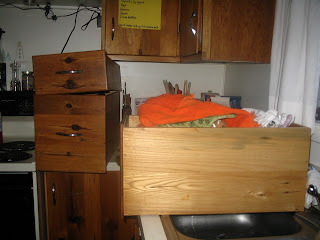 Oh yeah, and the fact that my dishwasher isn't draining so I can't use that (even if we did have water). 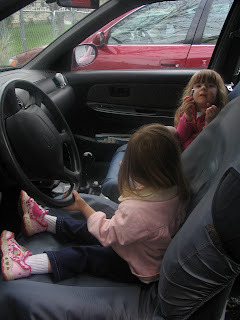 One of the girls favorite things to do lately is climb out of the car through the front seat. They take great joy in climbing over the console and climbing into "Mommy and Daddy's seats." Lily is so funny about whose seat is whose. She is convinced that Mommy should be the driver. I'm not sure if it's because I'm always the one to take them to daycare and back every day or if she just likes Mommy's driving better. Since Daddy sometimes is goofy while driving, I'll choose the latter! 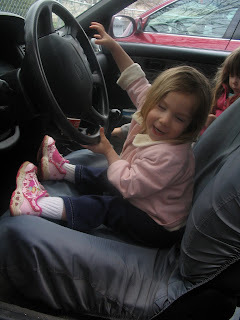 Oh yeah, that one's going to be a terror once she starts driving! All she needs is her cell phone in one hand and her Diet Coke in another!! I always thought that Driver's Ed really should teach the skills necessary - driving with your knees while eating, driving while someone in the backseat is styling your hair, driving from the passenger seat... you know, all the things that get teenagers into accidents. It's my 200th Post today!! There's still plaster over the chimney because Adam is afraid that if he starts chipping away at the plaster the whole thing will come crashing down. It's never a good sign when you come home to this! We ended up ordering Mexican food last night and going to pick it up. I suspect we're going to do a lot of grilling over the next week or so!! I Scream, You Scream, We all Scream for Dairy-Free Ice Cream! Can it really be May 6 and only 46 degrees F? Despite this, I'm really looking forward to a warm summer. Hopefully not a humid summer, just nice and warm. We took the girls for a walk the other day - they walked beside us all the way to Culver's (7 blocks). Addie and I split a dish of Cookies & Cream and Lily had the slow melt Popsicle I had stashed in one of the strollers. As we walked and chatted, I thought about Lily and if I was going to have to stash Popsicles for her for the rest of her life. It made me mad to think that there isn't a lot of options for people who want non-dairy ice cream. Sure, there's Soy Delicious and Tofutti, but there isn't anything in our area for people who just want to go out for a quick ice cream cone. Or enjoy something when their entire family goes out. Culvers has Lemon Ice in the summer, but they haven't rolled that out yet. Plus, I get a little nervous giving Lily anything from the land of Butterburgers. I think it would be amazingly cool to open up a dairy-free ice cream place. Heck, make it dairy-free, nut-free and gluten free too. However we live in the sticks and I think that dream will have to wait. So... anyone know of any good ice cream recipes I could try out? Anyone know of a good ice cream maker to try? Look Mom, I'm a Princess Cowboy! Monday- Hot Turkey sandwiches with mashed potatoes- I'm emptying my freezer this week to make room for an 1/8 of beef coming soon. Wednesday- Fish Tacos - I'm just going to brown the fish (sprinkled with a little cumin and chili pepper) in a saute pan, serve with shredded cabbage, tomatoes, salsa and cheese for those of us who can eat it. Thursday- Turkey Noodle Soup - it's a big turkey! Friday- Baked Teriyaki Chicken (or possibly grilled) - Our grocery store has a sale on chicken legs and thighs this week. Since there is nothing that my girls like more than "chicken on the bone," they should be happy campers! I just have to say that I love my local grocery store. I've requested several "Lily-safe" products over the last year and every time they get what I request. Last week I spoke with a manager (who just happened to ask me if he could help me find something!!) and asked if they would please stock some dairy free cheese. He pointed me in the direction of their soy cheese and I explained that they all had dairy in them to make them more "cheese-like." He was pretty surprised to hear that! I expect to see Vegan Gourmet soon!